How to Replace Temperature Sensors on Bosch Tankless? How to replace temperature sensors on Bosch tankless water heaters? When is the right time for the replacement? Temperature sensors on Bosch tankless water heaters are factory installed to measure the incoming cold and outgoing hot water temperature, compare and ensure that the correct set temperature of hot water is met. If everything is ok with the sensors, the unit will accurately measure water temperatures and provide the desired temperature of hot water. If, for example, temperature sensors have loose connections, are covered with the deposits and are corroded, the measurement will be incorrect, resulting in temperature fluctuation, uncomfortable showers, cold water instead of hot or warm, followed by the error code display, sometimes. Tools: Phillips type screwdriver, multi-meter, thermometer, cloth. Press the reset button to clear the error code, if present. Remove the front cover of the heater by taking out two screws. Loosen the three screws of the control unit that holds the control panel in place. 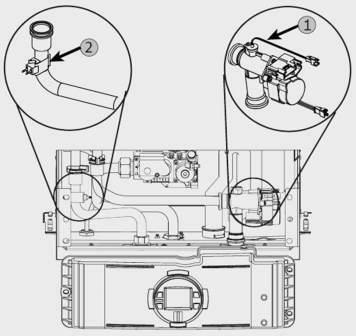 Locate the water valve and the inlet temperature sensor; these are at your right and right above the control unit, when looking at the front of the heater. Locate the hot water outlet pipe and its sensor; these are on your left. Open the hot water tap while the water heater is turned off, let it run for several minutes and measure the temperature of cold water. Upon closing the hot water tap, press and hold the program button (P) on the water heater and put the unit to ON position. The “188” code appears on the display. Release the P button. Now the display should read P2. Press the “+” sign on the control unit to get into the P4 diagnostic mode. Press the P button again and the E sign should appear. Scroll through the diagnostic modes by pressing “+” or “– “. Access the inlet water temperature reading by scrolling to mode 1d. Scroll to mode 2d to access the outlet water temperature reading. Press P to see diagnostic information and check the readings. The diagnostic temperature reading should be within +/-5 F of the temperature reading at the hot water tap. Put the water heater to the OFF position and open the hot water tap for several minutes. Unclip the wire connection from the sensors attached to the water valve and hot water outlet pipe and use the multimeter to measure the resistance (in ohms) inside the wire connectors. The resistance readings could be found here and match up with the reading at the hot water tap. If readings are different, sensor (s) may need to be cleaned and if defective, replaced. First, try to clean one or both sensors. Unclip it from the pipe or water valve and use the cloth to wipe clean both sides (and polish) where it makes the contact. Either you are putting the old or new clip back; make sure the sensors are correctly installed and are making a good contact. Resume the power and test the water heater. How to replace gas valve? How to fix noisy burner? How to remove and install heat exchangers?